AAEA invites you to register for the 2018 AAEA Annual Meeting in Washington, D.C., August 5-7. Most meeting events will take place at the Washington Marriott Wardman Park hotel. Be sure to reserve your room early - they are expected to run out in May! Reserve here to receive the AAEA group rate of $199. Before you book, be sure to check out our list of extra events listed below. This year there are a number of luncheons and pre/post-conference workshops to choose from. Review the Section Lectures & Luncheons and reserve a spot for Monday, August 6. Space is limited, so register early to reserve a place to hear the lecture, enjoy lunch, and network! This year we also have three pre-conference and seven post-conference workshops, all of which offer great educational opportunities. If you are interested, be sure to register early and reserve your hotel room for the extended day. 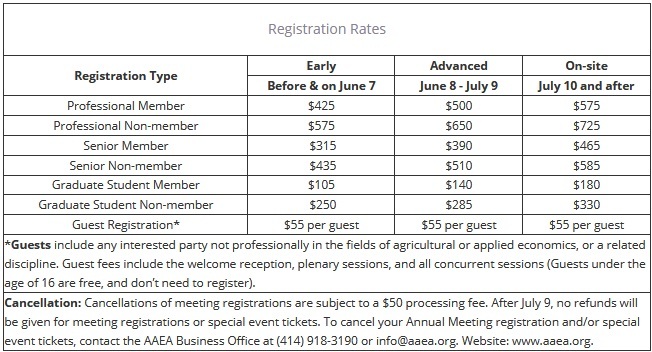 Below you will find registration rates for the 2018 AAEA Annual Meeting. The earlier you register the more you save! You can register online here and find our registration form here. This month, notifications will be sent to all authors who submitted a Selected Presentation abstract. Shortly after, a schedule will be provided to all accepted authors. Notifications will also be sent out in April with the results of the AAEA award nominations. AAEA staff at info@aaea.org or (414) 918-3190.